Two sculptures from this year’s Shad Valley workshop, both on display in Ottawa as centrepieces for our “Christmas in July” dinner. 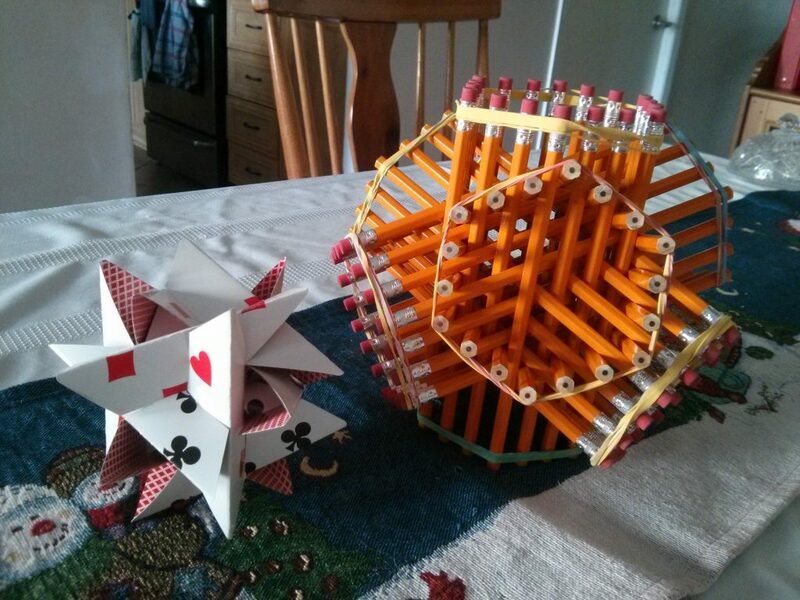 I built the 72 Pencils model on the right and my daughter built the 12-card slide-together on the left. In 1989 I attended Shad Valley, a one-month Canadian summer program for high school students. I spent a month living on the UBC campus. Basically it was Nerd Camp, though perhaps with a more diverse range of interests and talents than you might expect from the nerd stereotype, and with a definite entrepreneurial bent. It had a hugely beneficial effect on me, and I always wanted to contribute something back to the program. That’s why I was so excited when, as a professor years later, I was asked to run a one-week workshop for that year’s Waterloo Shads. I’ve been involved off and on since then, running a workshop whenever it fits well with my schedule. The topic of my workshop has always been Geometric Sculpture. It’s a sequence of construction activities from simple materials, heavily influenced by workshops I’ve encountered through the Bridges conference, the Gathering for Gardner, and other art-math events. I always enjoy running these sessions; the objects we make are clearly mathematical, usually artistic, and often challenging puzzles to assemble. Perfect for the budding Renaissance Types one meets at Shad Valley. For the sake of this year’s participants—Vince, Sam, Katherine, Max, Zoey and Seth—and for my own record keeping for future years, here’s a summary of this year’s constructions. A developable surface is one that can be constructed by bending or rolling an initially flat surface without stretching or deforming it. They’re of particular interest to artists and architects, because it’s easy to obtain many flat materials in roll or sheet form and bend them into shape. After a brief introduction to developable surfaces, we constructed D-forms from pairs of ellipses. The ellipses were cut from paper using a computer-controlled knife cutter. As a follow-up, we tried to make D-forms from a random collection of shapes I prepared, all with the same perimeter. We then proceeded to make D-forms from stadium curves (a stadium curve is a rectangle with semicircles glued on to two of its sides). If you choose the correct stadium curve you get a “Dual Sphericon” or “Sphericon Side Cut“, which can be seen as two halves of a cylinder joined with a twist. That led naturally into the construction of a Sphericon, and a fun discussion about its rolling properties. Over the years George Hart has created some lovely slide-together sculptures out of playing cards (see also the many real and virtual models by Francesco de Comité). We basically spent the entire session working on George’s 30-card slide-together, derived from the rhombic triacontahedron. Shads struggled mightily with the three-way lock required to complete this sculpture, finally realizing that I was serious about the puzzle aspect of the workshop! I believe that three of them eventually finished the sculpture and the others abandoned it. On the third day I tried something new that I had always wanted to build. The original inspiration was George Hart’s sculpture 72 Pencils, which I always admired but never contemplated in terms of a practical construction method. Happily, a web search also revealed an excellent tutorial that filled in the missing details. I also remembered seeing Akio Hizume’s very closely related workshop activities based on (much cheaper) bamboo skewers (though I can’t seem to find a relevant link online). Most people chose to make a simple cage out of 28 skewers (hexagonal bundles of seven skewers each, in four directions). Vince fell in love with skewers and built a monstrosity out of hundreds of them. Katherine built a lovely model out of 48 pencils, the predecessor to George’s 72 Pencils. I built my own 72 Pencils over the weekend for fun, though I still need to glue it together. That activity was pretty quick, as it turns out, so some Shads elected to return to the subject of playing card slide-togethers, and worked on George’s 12-card model. They all found it much more feasible than the 30-card sculpture, and most of them managed to finish it by the end of the session. It’s a bit hard to predict exactly how long all the activities will take, and so I had a few extra constructions waiting on deck just in case. Here they are, in case you want some additional rainy-day activities. I had a pile of origami paper ready. Some years I lead the group through a few modular origami constructions based on the Sonobe unit—usually “Toshie’s Jewel” as shown on the Wikipedia page, followed by 30-unit augmented icosahedron shown further down. Many years I introduce George Hart’s 12-unit modular kirigami construction Deep Sea Tango (with pre-cut units, of course). This is yet another very vexing construction, equal parts puzzle, mathematics, and art. If I really want to torture Shads I get them to try out Zach Abel’s Stressful. I love that sculpture. Conceptually, it’s so simple that you can grok the whole idea with a single glance, but it’s nevertheless highly challenging to put together. It requires both geometric intuition and genuine brute strength. It lives up to its name in more ways than one. Some of the activities above don’t have obvious templates that you can print out and work from yourself. I’ve filled in a few of the blanks with my own PDF document. That file contains printable templates for a Sphericon, a Trisphericon, Deep Sea Tango, and a 7-icon (a heptagonal analogue of the sphericon). It would help to provide some templates for D-forms (the ellipses, other isoperimetric shapes, and stadium curves), but it appears that I didn’t keep those files after cutting them. Shads: if you’re reading this and want to contribute links to online photos or other resources related to this workshop, please include them in comments below! One Response to "Shad Valley 2016"
Thanks for the awesome workshop! Had a ton of fun!